Other creations on Earth would Naturally Love like the Creator Loves. Their Love would be an Act of God. Human Love would be the Most Divine, because Human held a Choice to Love. Human’s Consciousness was born in Unity. We were the first Conscious Witness to the Creator’s Love in the womb. We spent a whole Tzolk’in harvest cycle there. Our very first round set a rhythm and pattern for every cycle that follows. Human’s Divine Path leads Consciousness to our Oneness with Divinity. A Divine Creator that intended all their ways had a Divine Intention for Human’s way. In Harmony and Equity with all of Creation, we would also hold a path. To Know it, Human would only have to Choose a Relationships with the Creator. The glyph illustrates milestones on either side of the Road. There would be Times and Places on Human’s journey that would be marked by synchronicity with the Whole of Creation. They were Divinely Given as a Provision of Faith. In these Times and Places Human would KNOW that they were exactly where they were supposed to be. We’d Know there was a Plan and Believe in our own Divine Guidance System. Our True North would be the direction of Love. The Cherokee Day Sign is the Rattlesnake Tooth. The Rattlesnake Tooth was an implement of Spiritual Medicine. It was used to break the skin where the healing would be given. Healing always represents New Life. Whenever we recover from a limitation, we sense a new lease on Life, Hope for the Future, and new Faith to carry on. These Times and Places are worthy to mark as milestones of our Spiritual Progress. The K’iche Day Sign is called E. E is known as the animator, “one that gives force, energy and action.” Human is the Animating Force to carry out the Creator’s Dream. The Choice to follow the Creator’s Will is Human’s Most Divine Offering. Through this Intention we would always deserve Divine Justice. An Intention is all we need. When we take the Leap of Faith toward it, a Divine Agency will help complete the climb. This 8 Road/EB marks a very important milestone in the cycle of Human Transformation. 7 Road/EB is the current Year Bearer of the Haab 365-day calendar, the full cycle of Mother Earth’s movement. 7 EB is this year’s destiny for planetary change. As a Whole we moved from 6 Deer/MANIK to 7 Road/EB. We began a new year Transformed by a new Momentum for change. Deer/MANIK led the Mission of the priest, to dedicate our Self to a path we would follow each day, and to carry out the rituals and ceremonies, and our prayers for the Whole. 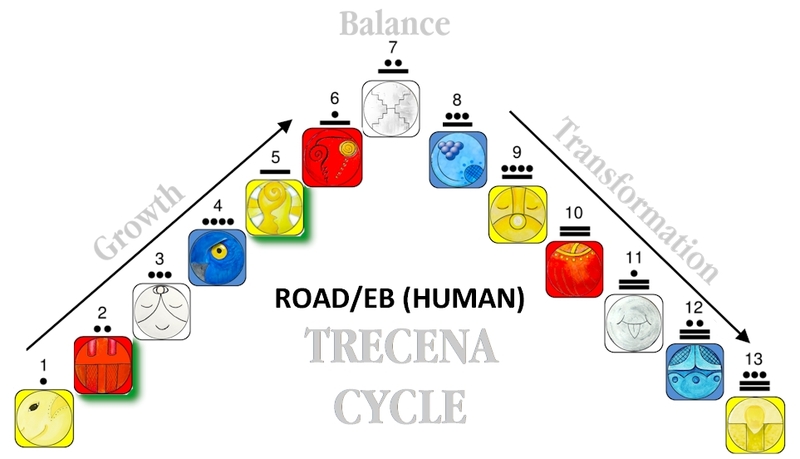 Under the year of 7 Road/EB, Human and our Destiny stands in the Balancing place. This cycle from February 20, 2019 to February 20, 2020, we are positioned at the top of the pyramid. From a Higher Perspective, we’re seeing the Truth of things all around. This Serpent/CHICCHAN trecena, we are intended to see “all that is, and all that is not” about Human and our Destiny. By August 22, 2019 we will KNOW what Human is capable to accomplish through Relationships of Love. In the final Ascension of the Tzolk’in, on 8 Eagle/MEN we will see our Human Destiny in its Zenith Light. Here and Now is the Time of our Life. We can create it, if we Choose it. The plans are already programmed inside. We already hold a provision of Momentum from the last Haab cycle. We are in the 6th uinal of Flow, the Momentum of a Rhythm and Pattern of Movement – turning to the Creator for everything we need. We can Ask everything we need to Know, and sacrifice Human Love for Divine Love. 8 Road/EB marks a zenith position of Knowing Our Way, backed by the Force of Momentum to carry out the actions that Personify the Creator’s Love. Today a whole new Road is opening to us. Dog showed us a way to Love. Monkey showed us the way to Create. CHICCHAN is lighting the Fuse, for Now is the Time to Love and Create. NOW is the Time of our Life. Now is the moment that marks a turn in our Road that leads straight to our Divine Destiny. We can Smell, Feel, and Sense in our Heart that we are on the Road to a Major Life Change. Road/EB resides in the South, the Direction of our Relationships with one another and with the Natural world. This is a Holy Day to Be, with the Life around us on Mother Earth. This is a day to Honor the Element of Earth. The rituals and Sacred Ceremonies of the Maya observed this day with a ceremonial fire that honors Earthly things – the sap of the copal tree used for incense, and other aromatics. This is a day to Remember that we carry on for our Ancestors as well as the Next Generation. This was a day to pray for Knowledge, Mental Strength, and Divine Discernment. The offering of copal or incense to be offered to the Fire was first held to the forehead. A prayer asked that any thoughts or perspectives that no longer served a worthy purpose be draw forth to be Offered to the Fires of Transmutation. 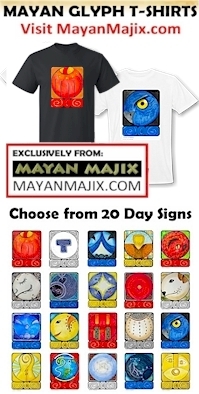 The equivalent Meaning and Purpose is an opening of the “Third Eye, ” to the Maya it is the One Divine Eye. To all my relations, may we Live this Time of our Life. May we greet a new Spring as if we never knew it before, or could never see it again. May we be Conscious of the Goodness of Life and all the Possibilities in Relationships with a Divine Creator. May we mark a Milestone that reminds us we are always exactly where we are supposed to be. In our first Choice for the Creator’s Will, our feet were set upon our own Path by Divine Intervention. May we Celebrate how much Love and Beauty there is to live for. May all our Roads be Blessed with the Light of the Creator’s Love. Today I ask for Blessing for my Dear Mom and Dad, celebrating their 72nd Wedding Anniversary. They eloped on April Fool’s Day, beginning a road together at 19 and 20. It started in Love and continues in Love. REMEMBERING THE POWER OF THE SERPENT/CHICCHAN, THE CHEROKEE CALLED THE POWER OF DO’TSI: Serpent’s symbol is Constellation Serpens. Serpent people are Sky people who come to Earth periodically as Educators. As above-So below, on Earth the Serpent is the Roots of the Tree of Knowledge. Serpent power is vital energy, the moving force, the instinct and desire for creativity, the trigger that sets off the action. It lights the fuse that magnifies and explodes the life force itself. Knowledge, combining science, technology and psychology, plus spirituality are seeded on the planet through the Gift of CHICCHAN. Manifesting the Dream of Ek’ Balam marks the milestone of my first Conscious Creation of an “impossible dream.” From the conception to the manifestation of the Dream, was a Jaguar Path I followed to believe in the Miracle. This was the day that I received your first donations. The Day “impossible” first looked “possible” – because others, shared my Love for a Dream. This was the day in the last round when I saw myself reaching the destination of Ek’ Balam. Through Divine Relationships, a Time and Place of Unconditional Love would become an eternal memory of the Truth of our Love for each other. I’m likely to mention 7 Road/EB a LOT as the Haab year – and it’s a very significant year in the road of our destiny. The “summer of love” was a Haab year 7 Road/EB. Those were also very chaotic times. Sorry, I repeated myself many times here as I didn’t see it post first. (New iPad-is what I’ll blame it on…) or may just an April Fool’s joke??? Can’t blame it on Mercury Retrograde anymore! !